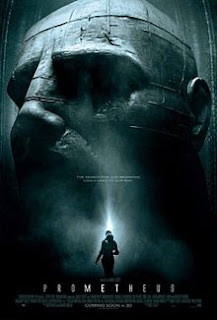 Having seen the much anticipated Prometheus yesterday evening, I have heard a mixture of opinions on it, and it seems that (certainly among my friends) opinion is divided. Perhaps I should preface this by saying that the only Alien film I had seen prior to this has been Alien. I loved its claustrophobic setting, grim (yet not overdone) horror and the overall tension created. I was on the edge of my seat the entire time. However, when I first saw the trailer for Prometheus, I did not associate the two (until later being told). I think going in without firm expectations of how similar I wanted this film to be to Alien (as many did) was a good decision. They are very different films. The plot of Prometheus follows a team of scientists who go to space in the hope of discovering the meaning of a series of symbols discovered in cave paintings and artwork from throughout human history. Whilst on the journey to outer space, the team is put into hyper sleep and watched over by the android David (Michael Fassbender). Once the team land, they make startling discoveries that will prove a threat to the whole of mankind. The scale of this film is impressive, it has a great score, and is visually quite stunning. I didn't see it in 3D, but I can imagine that it would translate well to that medium. The virtual map that David discovers is particularly beautiful, as are the opening shots of the Isle of Skye. The cast does an excellent job, and Michael Fassbender manages the perfect android, playing David with a subtle layer of something quite sinister. The other stand-out performance comes from Noomi Rapace who plays Elizabeth Shaw with a believable fear and determination that is reminiscent of Sigourney Weaver's performance in Alien. The film borrows some of the best imagery and motifs from Alien (similar looking creatures, and similar gory scenes) but remains a very different film. I have my suspicions that the less loyal you are to the original Alien films, the more likely you are to enjoy this one. I have heard people suggest that Prometheus doesn't deal with the philosophical questions it raises, sufficiently, namely that of the ethics of creation, and how far we should let curiosity take us. Maybe you could argue that this is the case because much remains unexplained at the end of the film. However, through David, the audience sees the results of creation interacting with creator, and it seems that much of the film's tension comes from David's uncertain motives. As a character, he is undoubtedly the most interesting. Maybe people don't like unanswered questions, but I believe that often that's the essence of a good film; one that provokes more questions from its audience as they walk out of the cinema. Perhaps the mixed responses are because people were expecting something different, but I still think it's an interesting, well-made science fiction film, and well worth seeing in cinemas. As ever, I point you in the direction of the film buffs at Filmophilia for a more detailed analysis of this film.